The Irish midfielder scored in Brentford’s defeat to Burnley after the Clarets reportedly had a €10 million bid for him turned down. Judge has 11 goals and seven assists this season. 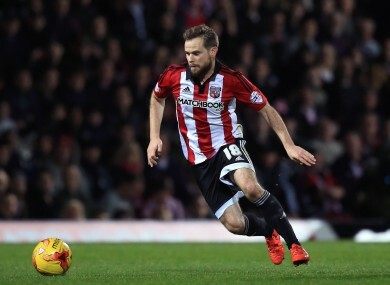 BRENTFORD MANAGER DEAN Smith has been singing the praises of Irish midfielder Alan Judge for the professionalism he showed on Friday night. The 27-year-old Dubliner has received a lot of interest from other clubs due to his excellent performances this season, which have produced 11 goals and seven assists, and Burnley reportedly had a £8 million (€10m) bid turned down last week ahead of the two clubs’ Championship meeting. Judge started the game at Griffin Park and scored a second half goal but it couldn’t prevent the Bees losing 3-1. “He’s a catalyst for what we do,” said Smith. “He’s a really good player and a good person. “I’ve got no qualms about anyone in the dressing room. They’re all really good lads. We forget these players are human beings and they’re young lads. Heads can get turned but some handle it better than others and Alan Judge epitomises what this football club is about. Email “'Alan Judge showed why so many people are looking at him and why our valuation is right'”. Feedback on “'Alan Judge showed why so many people are looking at him and why our valuation is right'”.